Since its inception, embodi3D® has worked to bring 3D printing in medicine to everyone for low cost, or even for free. One of the ways we keep the lights on is by offering subscriptions to democratiz3D® Premium. democratiz3D® Premium members have access to the highest resolution bone, teeth, and tissue algorithms that offer outstanding quality, but consume considerable server resources and are too expensive for us to offer for free. We realize that democratiz3D® premium may be outside the financial reach of some people. This is where the Pay or Share Program enters the picture. Pay or Share gives you the option to pay a per-download fee to convert your CT scans into 3D-printable STL files using our premium modeling algorithms and keep your STL and NRRD files private (Pay). Alternatively, you can also apply these same Premium conversion algorithms and choose to share your files, allowing all embodi3D® members free access to your downloads (Share). If you elect to share your Premium-converted STL file with the community, we’ll pay the conversion fee for you. A summary of the different activities and membership levels is shown in the table below. How does Pay or Share work? What if I don’t like the way my file turned out? Is this a change in embodi3D’s free services? As a regular member, you have the option to use our standard CT scan-to-STL file conversion algorithms for free. The Pay or Share program allows you to use democratiz3D® Premium features and pay a per-download fee, or download your STL files for free by sharing them with the embodi3D® community. Once you convert your CT scans, you can preview and inspect thumbnail images of your STL model. If you selected Premium settings during your conversion, you must choose to either pay to download your file or permanently share your STL file with the community. Remember: this only applies to regular members using premium settings; premium members still have unlimited access to premium settings and regular members maintain free, unlimited access to standard settings. The “pay” option is designed for users wanting premium features (ultra high quality downloads, privacy, modification controls, etc. ), but only require premium STL files once or twice per month. What if I don’t like the way my STL or NRRD file turned out? Whether you selected “share” or “pay,” democratiz3D® generates thumbnail images of both the NRRD and STL files. Always check the free thumbnail preview before downloading your STL file. You only pay for the STL files you download, so if you don’t like the way your file turned out, you may want to resubmit your NRRD for processing using different settings. Also make sure your CT scan is of an acceptable quality. CT NRRD to Dental STL conversion – This conversion is specifically designed to create highly detailed dental and craniofacial models that require millimeter and sub-millimeter precision. CT NRRD to Bone STL Very Detailed conversion – The “Very Detailed” option is an extension of our “Standard” and “Detailed” bone conversion algorithms. Very Detailed is useful in applications such as craniofacial and spine models where millimeter and sub-millimeter accuracy can provide beneficial details. Ultra Quality level – This level of quality can be applied to all democratiz3D® conversions. The “Ultra Quality” setting produces super-high resolution output files containing up to 3 million polygons. This is designed for demanding applications requiring large model sizes and those that require complex geometry and high detail. The figures below compare the results of some premium processing parameters to standard options. Image 1. Demonstration of operation and quality levels on a high-resolution dental model. 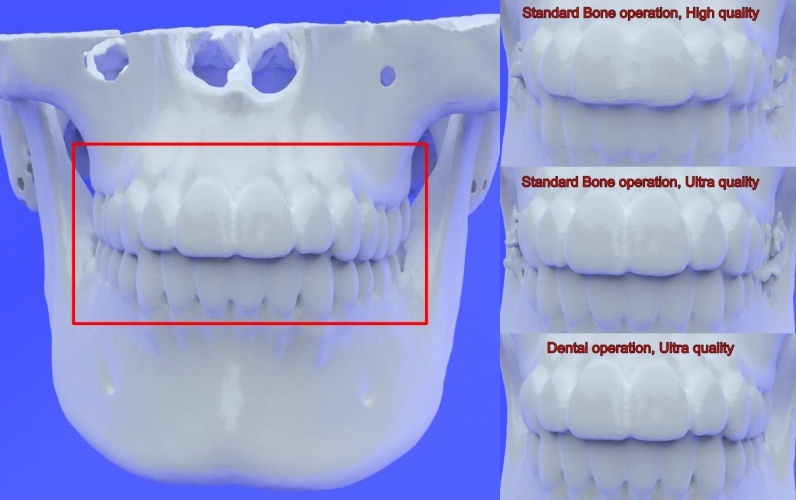 Using the Standard Bone operation and High quality, a free operation, the teeth are clearly shown but the fine gaps between the teeth are not clearly visualized. Using the Standard Bone operation with the premium Ultra quality level, the fine details and gaps between the teeth become more apparent. Finally, using the specialized Dental operation with Ultra quality most clearly shows the fine gaps between the teeth, most obvious with the lower teeth. Additionally, irregular artifact around the molars is not present in the Dental operation model. Image 2. Demonstration of operation and quality level bone and artery model. Using a high-resolution CT angiogram of the neck as a source, the vertebral artery goes through the C1 bone transverse foramen and then dives into the spinal canal over the C1 posterior arch (red square). Using the Detailed Bone algorithm on High quality (top left, Free), the separation between the vertebral artery and the adjacent C1 bone is not clearly seen. 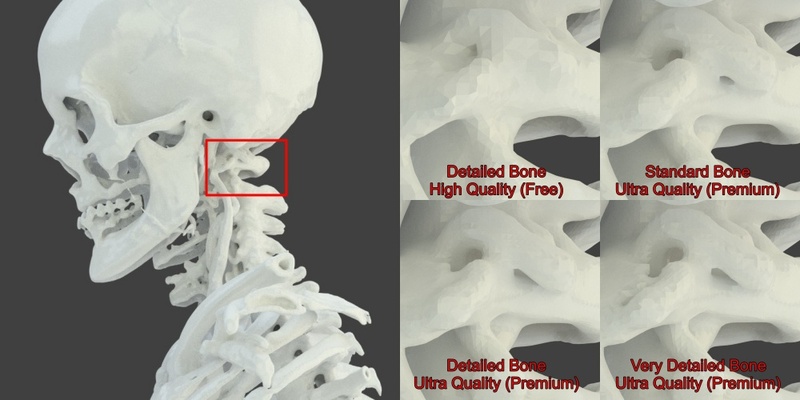 Increasing the quality level to Ultra and using the Standard Bone algorithm (top right, Premium), separation between the vertebral artery starts to become apparent. Using the Detailed Bone operation with Ultra quality (bottom left, Premium), the separation between these two structures becomes more apparent. Finally, using the premium Very Detailed Bone operation with the Ultra quality level (bottom right, Premium), the artery is clearly separated from the adjacent bone, and can be seen coursing through the transverse foramen and over the C1 arch. How much does the one-time “pay” option cost? Regular members have access to all democratiz3D® operations for free. STL models created with standard settings are free and unrestricted, and files made with Premium settings are also free for regular members as long as they are shared with the community. Regular members who wish to keep their files private can pay a one-time free to gain total control over their file (including making the file private). Premium membership subscribers have total control of all their files, both with standard and Premium settings. Free if you use standard operations or quality levels. Free if you are a regular member, use a premium operation or ultra quality setting, then permanently share your file for public download. Subject to a one-time, per-download payment of $9.99 if you are a regular member using a premium operation or ultra quality, and do not wish to permanently share your file for public download. Free for all operations and quality levels if you are Premium membership subscriber. Figure 1. Graphic showing how the Pay or Share program works. Regular members who are not Premium subscribers can still create 3D models with democratiz3D using Premium features. 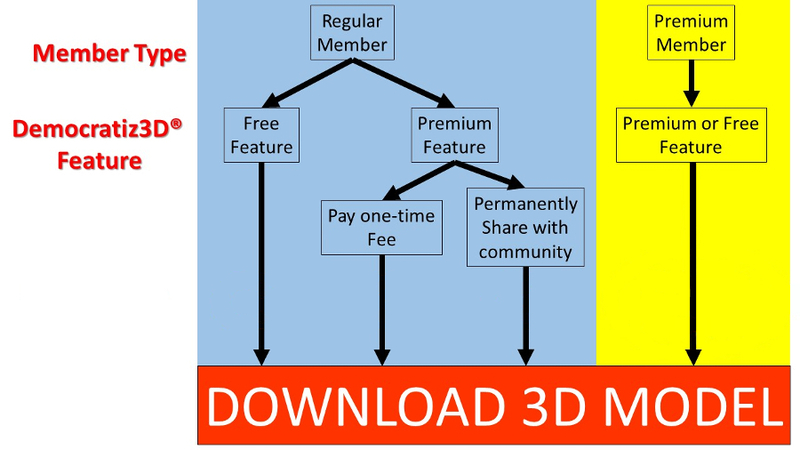 Regular members can generate democratiz3D® models using Premium features, but before downloading a Premium model the user can decide to either pay a one-time fee for use of the Premium service (Pay), or permanently share the file with the community and download the file for free (Share). Files will remain in locked status until the user has chosen one of the two options. Under this program, anybody can have access to Premium operations, irrespective of their ability to pay, as long as they share the file with the community. People who don't wish to share their files publicly or subscribe to Premium membership still have the option of paying a one-time fee for premium usage. Premium subscribers of course have unlimited access to premium democratiz3D features. Is this a change to the free services offered by embodi3D®? All services that were free on embodi3D.com prior to the release of Premium features and the Pay or Share program remain free for all members. This includes downloads, forums, tutorials, and standard democratiz3D® features, such as the Low, Medium, and High quality levels, as well as the CT NRRD to Bone STL, Detailed Bone STL, Muscle STL, and Skin STL Operations. All features that were previously free remain so. The Premium services merely provide more specialized processing.